Whose Airspace Is It, Anyway? Skydiving often seems like one of the most dynamic, chaotic sports in existence. People are falling from the sky every which way, for cryin’ out loud! 🙂 In reality, the chaos is highly engineered to allow us all to enjoy our dynamic freefallin’ fun while staying safe, and that engineering starts with ensuring that each group on each load has its own airspace column (with the exception of horizontal flying dives; we’ll get to those shortly). Why is this important? Each group that’s essentially falling straight down (everything but a tracking/tracing/wingsuit dive) needs its own vertical column of air for freefall and deployment, period. If we don’t have that, then we have groups crossing above/below each other in freefall, which carries a significantly increased risk of collisions between groups particularly if they are falling at different speeds (think freeflyers falling much faster than belly flyers). These collisions can be quite serious. We avoid these collisions by planning each load’s exit order and exit separation timing to create a safe amount of horizontal spacing between groups. With this strategy, each group has its own predictable airspace column and other groups know where those columns are. They then know where to look for the groups that exited before/after them when deploying. An important point to note with this each-group-has-its-own-airspace-column concept is that it assumes each group is falling mostly straight down, without any significant planned horizontal movement except for breakoff/tracking at the end. One thing we often see with solo skydivers, especially those without very many jumps, is that they can move a lot either forwards or backwards when they don’t have another jumper there as a nearby visual reference. Unintentional sidesliding is usually much less significant. Thus, if you are doing a solo skydive, primarily face 90° to (across or perpendicular to) line of flight (LOF) rather than up or down LOF. This will reduce the chances that you unintentionally backslide or track into another group’s airspace. Jumpers planning horizontal movement (tracking, tracing, wingsuit) dives need to consult with the day’s conditions/flight plan on the Safety Stand before jumping. Each day, the pilot will post the day’s winds aloft, planned jump run, jump run groundspeed, and which way he/she expects wingsuits and trackers to fly. It’s imperative that horizontal flyers follow this plan so everyone, including pilots, knows where all groups expect to be on deployment. 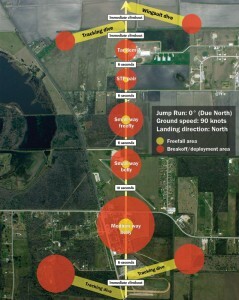 This is especially important for wingsuiters that can cover a couple of miles in freefall; the pilot must know where they plan to be so he/she can avoid descending the aircraft in that space. 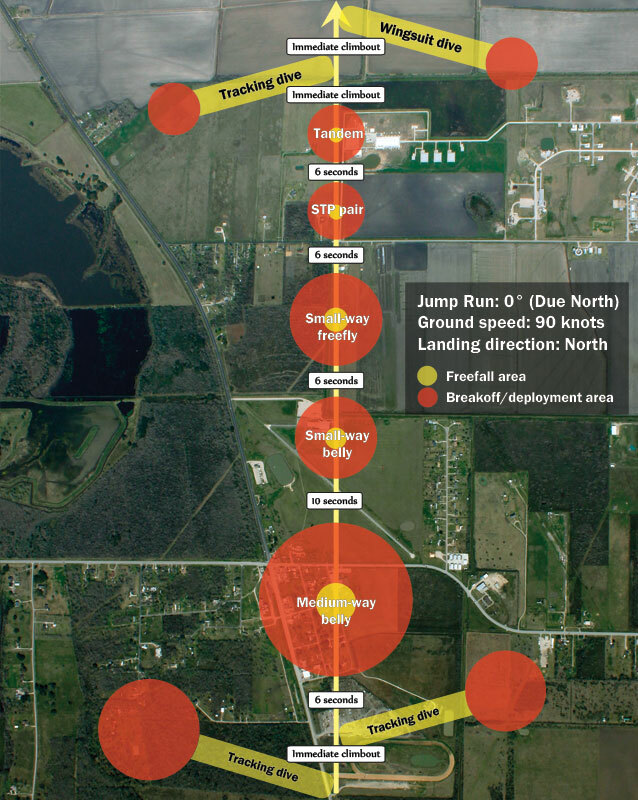 Here’s a sample jump run with exit separation for a hypothetical full load with several widely varying types of skydiving groups. This is one of the more complicated jump runs one would see given the mix of several small groups doing different things. However, it shows how we should exit the aircraft for maximum safety with the various groups, guaranteeing that each group has its own airspace column for freefall, breakoff, and deployment (yellow and red areas on diagram). Horizontal flight groups should exit first (with two groups or less) and last (third/fourth horizontal groups). Wingsuiters exit after all other groups, large to small. No more than four horizontal flight groups per load. No delay between climbouts of successive horizontal flight groups, as they’re tracking away from each other to create separation. Separation between skydiving groups follows the exit separation chart here according to the size of the group. After deploying, do not fly up or down jump run until you have identified the canopies of the groups exiting before and after you and ensured that there are no traffic issues. Check your spot before exit, and if your spot is long, open a little higher so you can make it back. See today’s conditions printout on the Safety Stand for any exceptions to these policies.